Paranjoy Guha Thakurta is an educator and commentator. The BJP government, until recently, had followed in the footsteps of the UPA government by delaying payments. Is the Mahatma Gandhi National Rural Employment Guarantee Act a “living monument” of the failure of the economic policies of the Indian National Congress which has ruled the country for all but roughly 14 years since August 1947? Or is it that the MGNREGA, a law enacted a decade ago which seeks to implement the world’s biggest and most ambitious job creating scheme, one of the few programmes that has been successful in not just alleviating poverty but has also empowered the underprivileged in the largest democracy on the planet? The good news is that Prime Minister Narendra Modi, who had sarcastically derided the scheme in the Lok Sabha less than a year ago, seems to be eating his words today. His finance minister, Arun Jaitley, has publicly proclaimed that the Union government will not curtail the flow of funds for the programme at a time when there is widespread rural distress across large parts of the country following two successive years of deficient rainfall. Mr Jaitley is likely to put his money where his mouth is when he announces the budget proposals for the coming financial year on February 29. Mr Modi and Mr Jaitley were not alone in pooh-poohing the efficacy of the MGNREGA in creating employment opportunities for the poor in rural areas, besides curtailing lean season migration to cities from villages and creating assets out of manual labour. There was a very substantial section within the Congress, possibly including former Prime Minister Manmohan Singh himself, who thought along similar lines at one stage. This section rang alarm bells about the inflationary impact of paying high wages to unskilled farm labourers and also pointed out how the benefits would not reach the really needy but be misappropriated by corrupt contractors — to an extent, these apprehensions were not entirely unfounded. Those who were sceptical about MGNREGA argued that there is no use making rural roads which are washed away in the next monsoon. They contended that the world had come a long way from accepting the policies that were advocated by the late British economist John Maynard Keynes (1883-1946) who had argued that the best way to get out of a recession (or an economic slowdown) was for the government to play an interventionist role by spending on infrastructure projects to stimulate the economy. He had even sug-gested that during a rece-ssion, the government shou-ld create jobs by asking people to dig holes and fill these up. After the outcome of the elections to the Bihar Assembly were known in November 2015, Mr Modi and Mr Jaitley may have realised that while there are indeed many flaws and inadequacies in the manner in which MGNREGA is (and has been) implemented, the programme can nevertheless be an effective way of enhancing incomes of the poor who live in villages. The economic policies of the BJP and the Congress — the two largest political parties in the country which together account for around half the popular vote — have never been particularly dissimilar. As Professor Himanshu of JNU, who has tracked the progress of the scheme, recently pointed out, the UPA government led by the Congress — which, to its credit, enacted the legislation — was “also responsible for the programme losing steam after 2010”. The consequence was there was a steep decline in the total employment generated, from a level of 2.84 billion person-days in 2009-10 to 1.66 billion person-days in 2014-15. The average number of days of employment provided fell from 54 person-days per household in 2009-10 to 40 person-days per household in 2014-15. Whereas seven million households completed 100 days of employment in 2009-10, this figure was down to 2.5 million households in 2014-15. The BJP government, until recently, had followed in the footsteps of the UPA government by delaying payments. 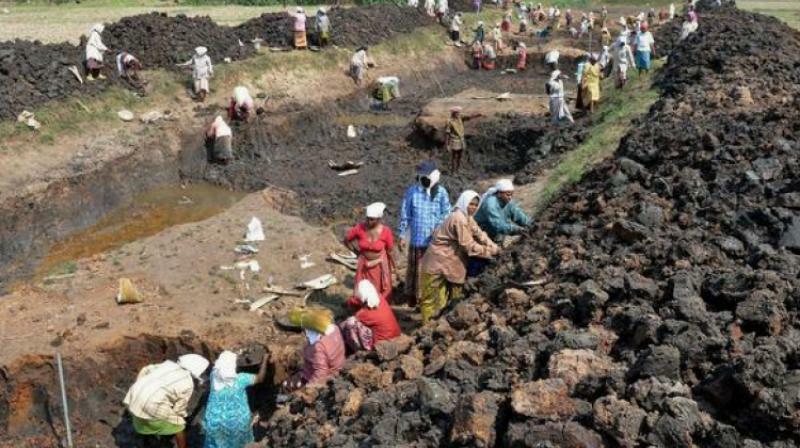 The total expenditure on the MGNREGA increased from Rs 8,823 crore in 2006-07 to Rs 39,377 crore in 2010-11 but declined thereafter to Rs 36,224 crore in 2014-15 in nominal terms. The budget for the current year has provided less than this amount, a bit above Rs 33,000 crore, but the actual outlay is lower because the amount includes arrears in excess of Rs 4,000 crore and does not factor in the rise in real wages. According to Prof. Himanshu, after adjusting for wage inflation, the expenditure on MGNREGA has actually halved over the last five years while administrative expense has almost doubled from less than five per cent to nine per cent! Still, one should be grateful for small mercies. government functionaries seem to have realised that curtailing the MGNREGA programme, while claiming at the same time that their hearts are bleeding for the farmer, is akin to committing political suicide.